This Alex traditional black flush outdoor wall lantern is rated IP44 and perfect for lighting your garden and outdoor areas. Flush to the wall mount and tapered half-lantern, with clear glass lantern panels, detailed top and finial. The mount is finished in white to reflect as much light forwards as possible. 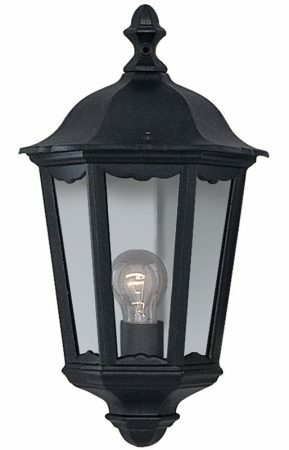 A simple, classic design, with elements from Victorian street lighting bringing a traditional style to the exterior of your home. The wall light is also IP44 rated to protect against the elements. Supplied by Searchlight who manufacture some of the best traditional and modern classic designs such as the Alex black half outdoor wall lantern you see here.